A Free-to-Play Star Wars MMO for Families? What's not to like about a free-to-play Star Wars online multiplayer game aimed at kids and parents? Nothing, unless you're not a Star Wars fan, kid, or parent. Assuming you are, Sony just revealed that Star Wars: Clone Wars Adventures, a new action-angled, absolutely free-to-explore virtual world in the offing for Star Wars: The Clone Wars animated TV series fans, should launch online and at retail this fall. 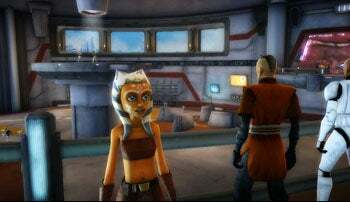 Sony says it's working "hand in hand" with Lucasfilm, LucasArts, and Sony Online Entertainment (Everquest II, Star Wars Galaxies, Free Realms) to make Clone Wars Adventures "the most authentic and accessible Clone Wars experience." The company describes Clone Wars Adventures as "the ultimate destination for fans of The Clone Wars series," and that it's "create[d] a virtual world that is seamlessly integrated with the TV series and a true extension of the show." So what's the game about then? Minigames, social events, and "thousands of customization options" round out the list of things to do, and yes, you'll be able to swing a sizzling light-stick alongside Anakin, Obi-Wan, Yoda, and Ahsoka Tano. You'll also get to "speed through space in a starfighter," scupper starships, zap battle droids in something called Tower Defense, try your hand (or robotic R2D2-like claw) at Droid Programming puzzles, play cards, race speed bikes, rack up trophy-style achievements for social bragging rights, and "become the next great hero of the Republic." Safety first, says Sony. The company wants Clone Wars Adventures to be an online environment parents can trust, so they're including parental controls and safety customization tools, including "pre-canned chat and playtime settings" to help safeguard younger players. Did I say free? Here's where it's not: Sony says players can purchase "legendary Star Wars outfits" and "items and accessories" using SOE's virtual currency, Station Cash. You can also upgrade your account with a monthly membership, which lets you "take the galactic action to the next level" (whatever that means). And while it's not mentioned in the press release, bet on ads, shrewdly inserted as part of the gameplay itself. Nothing so vulgar as "Use the force, young Padawan...but first have a Pepsi!" More like "Free glass of bantha milk if you view this ad from our sponsor." While the press release bills the game as PC-only, LucasArts vice president Mary Bihr mysteriously or perhaps just mistakenly says the game is "for kids and families to play in their very own living room." The same living room predominantly the purview of Xboxs, PlayStation, Wiis, and not PCs?